CBSE Improvement exams 2019 for 10th and 12th class students is now available both online and offline, Check below all the details where to download and where to fill this Improvement Forms 2019. Students need to fill the Improvement Exam application form 2019 in order to improve their 12th class marks by appearing in Board exams in next year. every year CBSE held improvement exams for those students who want to improve there marks in the 12 board class. 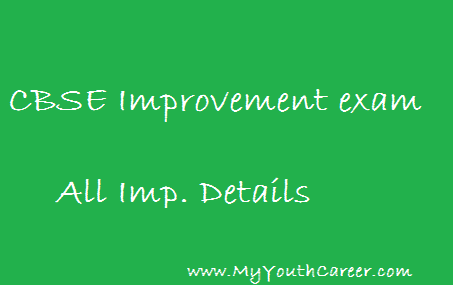 So, by registering for this exam they can be eligible to appear in the Improvement exams. Every detail regarding CBSE Board Improvement Exam 2019 and their application forms will be provided below. CBSE board improvement exams will provide students a flexibility to improve their marks, as I said improve there will be no such issue of declining in marks as if your marks are lower then this previous exam marks then previous year marks will be considered in your DMC. For all the students who are just feeling low about the number of marks they have scored in 10th and 12th class marks they can now be able to increase there score by just appearing into these Improvement exams also for those students who are below to any threshold marks, now they can clear the threshold marks of percentage by just appearing into it. Students can be able to give single improvement exam or all five subjects Improvement exam by just filling the details in application forms. Also, need to enter your school number, in case you’re a private candidate please enter the number 99999 as you won’t be having any school number. Do write your examination center, your Admit card will help in this. After all this, please hit Proceed and Fill the form online. Now you need to do the payment, which can be done either online or through Bank Challan. Now ahead towards confirmation page and do as it says at last! 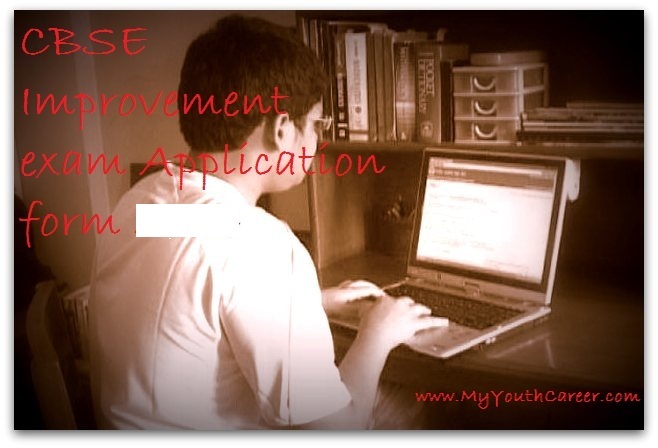 Students can easily get the application forms from the school administration and those students are only eligible who appeared for the exams in 2019 also who are from Delhi or any other region can easily apply through Official Website of CBSE for Improvement exams in 2019. Various Schools affiliated to CBSE will themselves provide Students Improvement exam application forms so that they can be able to fill it up and submit them on the spot. Students can buy the application form for just Rupees 200 /- only. Students can get each and every detail about CBSE 10th and 12th class Improvement exams 2019 and respective Exam dates here. 10th class Improvement exams have been announced So fill the forms from your school and also online on CBSE home site for Improvement exams. Sir i had compartment in maths and chem. And i have to do b.tech ! This year i am appearing for maths compartment only to pass 12th! Sir koi way h jisse mera saal kharab naa ho ! Ya fir koi aur way btaiye ! CBSE 2018 comportment repetors exam which month start offer July is missing because when start the month we can fill the form online augst or September I was confused please send current date circulars. Now you have to appear in the next year exams. sir i need ur help..
how to get application form..?? sir.,i s there any procedure to cancel compartment exam application form…i have not done the payment yet..?? one subject ie physics but by mistake i’ve selected all the 5 subjects nd have now received a message that my form has been accepted. I want to appear only for physics exam because I’ve passed the other 4 subjects earlier. Is there any way through which i can correct the application form?? I WANT TO FILL 12th REAPPEAR MATH EXAM . SO PLEASE CONFIRM ME . THE DD WHICH MADE IN FAVOR OF. its already mentioned on the form. Hi sir i m rahul i want to know about 10th class board exam in 1015-16 actually i losses in 9 th class because of one subject maths only for two three marks…so i decided give examb by open but i will not submitted form in april month 2015+16 becoz of any reason but i want to give exams of 10th class board in this year 2015-16 exam is it possible plz rply fast..
Good evening sir g i m arjun singh sir mere bhai ki english me compartment aayi thi or ek chance me bhi wo dubara fail ho gya kya sir aap ye bta sakte ho ki compartment ka paper dubara dene k liye form kha bhrna pdega or kab?? Sir I have got compartment in 12 non medical in three subjects – maths ,physics,chemistry . sir pls give me idiya that this year is not waste sir …now what I have to do sir pls rply fast sir I am really very very sad sir pls ..
go for compartment exams, thats the only thing you can do my dear. don’t feel low you can easily get over it. Don’t think about wasting year either think to score well. I will better suggest you to drop this year start preparing well. I hv jst cleared my 12th class with 85.5%….eng 88,acc 93,bst 92,maths65,eco 69…i want to give improvement exam for maths…please tell me the procedure and after imp. Exam can i get admission in delhi university because exams will be held in seltember so is that ok for admission??? I want to take admission in b.tech in chemical engineering.. bt mah no. Are not so good and i also get compartment…. Plss suggest something what to do…. Am very disappoint wid mah result…. I have completed my 12 in the yr 2014-15 now I m pursuing B.com first from maiteryi non clg but I want to improve my marks in 12 class . can I do or not? Sorry Ma’am, even we don’t have any idea about that. You must consult with school administration. Sir some websites r telling that 12th class improvement form can fill now a days up to 22june but some websites told that in September 2016 . Sir please tell me what is right. but I also dont want to spoil my precious year too…. Can I secretly pursue for engineering and then give biology improvement exam within this year (or next) without telling anyone? If you have to show your percentage to any one or any organization, you will be issues with new certificate including DMC. If in can you opt not to show anyone this new DMC, there is not fun going to improvement exams if u can’t show anyone. But next year after improvement exam can I admission in 11th class with science stream in regular school. CBSE improvement form ki payment dd se hogi to me bank se dd kis naam se bnwau??? You must consult cbse head office for more information about payment. Sir I have passed my 12th this year from U.P. and I want to give improvement paper but my father got transfer and our family shifted to uttrakhand. So can I give improvement form uttrakhand. After the announcement of results. sir i passed out class 12 in 2018 . but i want to improve my mark and i want to appear in improvement exam . so plz tell me can i do gradution with improvement exam? sir ,improvement exam ka form kab aayega? Sir I want to improve my score in class 12th in my 2 or 3 subjects (maths,chemistry and physics). Please tell me the dates and procedure of filling the improvement form as soon as possible. Sir maine 12th passed kí hai 2017 mei and mere ek subject mein kam marks hai ..maine improvement ka paper dalna hai…to mai ab kab fill kr sakta hu?? Yes, you can use your improvement exams marks everywhere you want! Latest DMC will only be valid. It means the DMC which you will get after improvement exam will only be valid not the previous one. respected sir, i m student of class 12thcommerce before 2 days of board exm i met with an accident so that i cant able to give all exms becoz i was hospitalised. Now what should i do? is i am allowed to give my all exm with re-students. You need to appear with the students appearing compartment exam. Sir, can i know when will happen or in which month compartment exam held for class 8 th student. There is a confusion on improvement examination, I just passed 12th class in 2018 not satisfied with my performance. I would like to improve my marks by appearing again for main subjects, when I would be able to write examination? this year July 2018 or March 2019? Kindly send me detail. thanks. You will be able to appear in the September improvement exams. Sir if i apply for all 5 subject for improvemnt and if i get overall good percentage in my improvemnt exam than anual exam but i fail to get good marks in 1 subject than previous year then which marks will be taken previous one or the marks i got in improvment. If my result improve better than previous. Will there problem in any competition to fill up form . No, there won’t be any such problem. Sir, I appeared in the 12th 2018 examination with 6 subjects [ 1 additional subject is there ], and when my result came I was fail in maths which is my main subject but the overall result is pass due to that additional subject & my result is considering maths as a additionl subject. So, can I appear in 12th’s compartment exams for maths this year ? Or I have to wait for the improvement exams. yes, you can appear for compartment exam. I have passed in class 12th 2017-18 but not eligible for jee.i appeared in another test by the time the result will be out filling up of the form date will be over.in case I got selected in this exam I will not go for improvement ,but if not I have to drop can I fill up for improvement. And won’t appear as I will be I a college.considering I got selected ….CAN I FILL UP THE FORM AND WONT APPEAR AND GO FOR HIGHER STUDIES. Even if you are in college you can appear for the same! Sir I got only less mark in one subject and want to improve it how can I do if it will improve my % will be 85+please suggest it my 10 class board.. If I fill imrovment form for class 10 CBSE in 2018 then exams will be held on which year??? We are expecting it in the month of August. Thank you sir.. Sir I want to ask you that I had given my 12th boards in 2017 so may I give cbse improvement exams.. Thanks again thanks slot sir..
Sir, first of all thanks for your swift reply. One more thing to know, after passing compartment exam of maths, will my result consider maths as a main subject and will the additional one go to the additional subject column ? I will be as suggested in your roll no. I have appeared for 12th board exam in the session 2017-2018. I got 71% being in science stream. I want to give improvement exam but I don’t know when will it held? Will it held in july 2018 or August 2018 or march 2019 with the entire nation? What is the date of examination? As different sites are saying different dates ? improvement exams will be live in September’ 18. Sir, what about the internal assesment marks? Will some other procedure take place or the same marks will be added? And can the student sit in the next class? Sir, I have appeared for 12 board exams this year and not satisfied with Maths marks and want to improve, so can I give improvement exam next year, in the month of march as if I even gave exam this July somehow my this year will be ruined. Instead I can study whole year and appear next year in the month of march. Is it possible? sir ,12th k lye improvement form kb ayega???????? I have got compartment in chemistry,and I clear the compartment exam.now can I give improvement exam in maths ? I had compartment in chemistry in 2017 cbse board exam and i don’t give compartment test i would like to re-exam in 2018 is it possible. Yes, drop for an year. Hello sir,mane 2018 mai 10th pass Ki Hai. meri all over 60 percent hai.but math mai 33 marks hai.or Mane 11th class mein commerce without math li hai..mujhe math me 10th class Ka improvement karna hai,isse mere 11th class par Koi effect to Nahi Padega ? mujhe improvement karna chahiye ya nahi ? It’s better to go for it. Re compartment ka paper kyse bra jayega or Khaa please sir hepl me please sir ?????? I am giving 10th cbse board. I want to give improvement exam for science. Can I study 11th while preparing for improvement?